Product prices and availability are accurate as of 2019-04-11 19:48:28 EDT and are subject to change. Any price and availability information displayed on http://www.amazon.com/ at the time of purchase will apply to the purchase of this product. 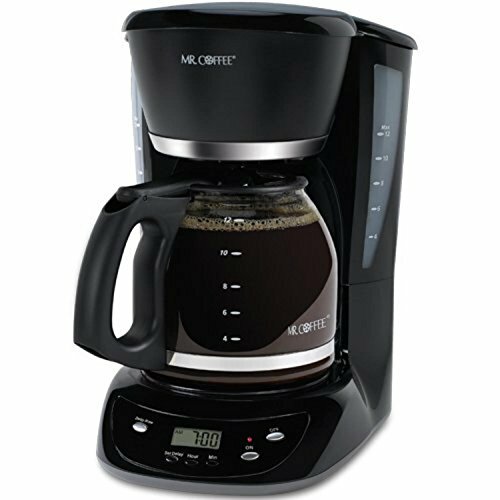 The Mr. Coffee 12-Cup Programmable Automatic Coffee Maker brings style, taste, and functionality together to create a rich blend that you'll savor for years to come. It features plenty of programmable options, like Delay Brew for coffee when you want it, or Brew Strength Selector to produce a bolder, richer taste. As coffee brews and that heavenly aroma fills the air, you can grab a cup before the cycle finishes with Grab-A-Cup Auto Pause. And since coffee is all about taste, you'll be glad to know that the Water Filtration system removes chlorine and impurities from the water during the brew cycle.